The Seagate Backup Plus 8TB is hard to resist if you're looking for a portable storage solution with acres of space to spare. It sips power, doesn't cost the earth and is blazingly fast – what's not to like? This is the first 8TB hard disk drive we've received at TechRadar and the biggest external (single-drive) hard disk currently on the market. This particular model – the Seagate Backup Plus – was announced earlier this year but uses an enterprise-grade drive which was unveiled back in August 2014. You could probably cram about 1500 DVDs in 8TB or the content of 160 Blu-ray discs, or the equivalent of almost six million 3.5-inch, 1.44MB floppy disks (remember those?). Seagate's mammoth drive, otherwise known as the STDT8000200 in the UK and STDT8000100 in the US, is so new that it hasn't appeared on the company's own website yet. It sells for around the £250 mark (around $365, AU$485). So how exactly did we get there? This storage capacity was achieved by making use of a new technology called SMR (Shingled Magnetic Recording) which allows the cramming of more bits on a given surface by using a similar technique to what roofers do with roof tiles. Drives that use SMR have one flaw – they do not perform well when it comes to sustained, random writes. They do however excel when it comes to sustained read speeds and burst write speeds. Potential purchasers will need to bear that in mind or they might otherwise be sorely disappointed. As one Seagate spokesperson put it to us recently when talking about SMR, the drive is ideally suited for backup and archiving, akin to an LTO tape and, as he remarked, "you don't do random writes on tapes". So the ideal scenario would be that of a WORM (write once, read many) replacement, where writes are rare but reads are plenty. 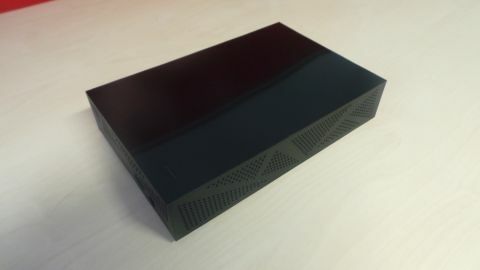 The Seagate Backup Plus looks like a brick, a black one with a mirror top (very prone to fingerprints and dust). Each of the sides (bar the top and the front) have between four and six triangles with dozens of small holes to improve ventilation. While that sounds bleeding-edge or even avant-garde, I didn't warm to the design simply because the corners are bloody sharp (pun intended). Be careful as this casing can draw blood from you; it did for me and at least one other reviewer. Other than that, there's a micro-USB 3.0 port and a power supply port, a standard 12v 1.5A model. A status light on the top facia will let you know when the drive is in operation. Note that there is no on/off switch which means that you have to unplug the power supply or switch off at the mains to power down the drive completely. You also get a 1.2m USB 3.0 cable which is longer than what we're used to. Inside the Backup Plus is an 8TB drive from Seagate's Archive HDD family, which intriguingly belongs to the company's enterprise portfolio. You'd expect to use these mostly in data centres, for cold storage and in so-called hyperscale scenarios, not in a prosumer/consumer product. The drive, which we believe to be the ST8000AS0002, comes with 128MB of cache, about four times the amount of large capacity hard drives. That's mostly due to the SMR technology which requires the drive to handle data transactions on-board, a process Seagate calls "drive managed" and is facilitated by this larger buffer cache. There are six 1.33TB platters, possibly spinning at 5900RPM, with 12 heads, and a rated workload rate limit of 180TB per year (that's essentially erasing and rewriting the drive 20 odd times over – note that the Backup Plus only comes with a two-year warranty though). The drive can be used 24 hours a day and sips power when in standby mode (less than 1W) and even in operating mode, consumes just 7.5W. Note that these figures are for the internal drive (Seagate hasn't provided the figures for the Backup Plus). You will need to add a couple of Watts for the actual power consumption but it is fair to say that leaving it connected 24x7 wouldn't be a bad idea given that it is essentially built for doing just that. The Seagate Backup Plus 8TB is probably one of the fastest external hard disk drives we've tested. Sure, put a 1TB SSD in an external enclosure and you'd end up with something faster – but compared to other traditional platter-based hard disk drives with a low RPM, it is a stunner. It reached a staggering 124MBps in sequential read, and a jaw-dropping 195MBps in sequential write; both figures were obtained via the popular storage benchmark, CrystalDiskMark 3. Oddly, Futuremark's PC Mark 8 wouldn't run on the drive and would consistently crash. Futuremark told us, that in theory, there shouldn't be any issues associated with SMR. We will continue to investigate and shall update the review if we manage to get to the bottom of this problem. The device also comes with Seagate's own optional Dashboard application which allows you to automatically back up your smartphone's content to the drive (via a free app) as well as your social media (from Facebook, Flickr, YouTube and Tumblr) and even cloud-based content (Dropbox, Google Drive, OneDrive). It proposes two backup options, one scheduled and one for continuous backup. Value-added applications tend to be very basic and Seagate's own Dashboard is no exception – it provides the bare minimum allowing the user to choose more complex solutions, should they want to do so.